Are you looking for a great bargain to lease, rent, or purchase the Muratec MFX-2590 multifunction printer within your business’ tight budget? Well, look no further because Arizona Copiers has the greatest selection of the most high-quality Muratec models at discounted prices. Within our inventory, you will discover whichever configuration or customization to suit all of your business’ needs perfectly. Our locally owned and operated business is dedicated to customer satisfaction, so we guarantee to deliver speedy delivery, exceptional customer service, and assistance for all repair or supply necessities. Please contact us today with all questions or inquiries you may have at 602-428-5885. We look forward to hearing from you and assisting you in your copier purchase experience! The Muratec MFX-2590 features innovative document solutions that deliver excellent multifunction performance for the ultimate streamlined workflow for your business. The unit creates single-sided prints and copies at the fast rate of 25 pages per minute, while the embedded duplexer delivers two-sided printing at 7 pages per minute. For added convenience, the printer allows users to store commonly produced documents, such as forms or other work documents, right into the system’s memory for on-demand printing in a flash. This Muratec model is equipped with a 50-sheet multipurpose bypass tray that provides efficient solutions for printing labels, envelopes, letterhead, cards, or transparencies. 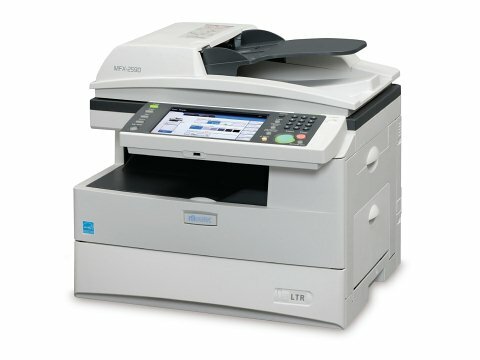 When you purchase the Muratec MFX-2590 from Arizona Copier, you are getting more than a high-quality printer and copier. Your business will also benefit from a high-resolution color scanner that can scan two-sided documents at speeds up to 62 images per minute. Scan documents directly to a USB flash driver, e-mail addresses, or fax numbers easily. DirectScan features also enable your business to directly scan documents into network PC folders without the hassle of installing extra software or drivers. The Muratec model has a fully integrated address book as well, which can store vital information for up to 2,000 contacts. The Muratec MFX-2590 is also outfitted with one of the most intuitive user interfaces on the market. The large 8.5-inch color touch screen allows innovative machine programming and job execution applications with the swipe of a finger. When using the machine in MFP mode, the printer will display all of the most commonly used features on the home screen for instant access. All of your essential production preferences and applications will be within easy reach for optimal workplace efficiency. Muratec copies are well-known for being a high quality choice for businesses looking for a cost-effective solution to all of your copying and printing needs. The Muratec MFX-2590 is no exception, especially with its high resolution printing, one-touch scanning, and effortless touch screen navigation. The Arizona Copier company will be able to provide the most affordable options for buying, renting, or leasing this superior Muratec model to increase your business’ productivity significantly. We encourage you to get in touch with one of our knowledgeable representatives to get started on your business’ next best purchase of the Muratec MFX-2590 multifunction printer.